Fanny — Piano. Push. Play. Our idea is rooted in our belief that music adds color to our lives. Both life and music bring us ups, downs, highs and lows; whether it’s in city streets or concert shows. We brought this concept to life by visualizing what the tones might look like as colors when you play. Thanks to Piano.Push.Play, Portland Art Museum, and all of the people pushing keys in Portland. Nemo Design is a Brand Strategy and Design Firm based in Portland, Oregon. Since 1999, we’ve created colorful campaigns, experiences, and brand work for the world’s leading athletic, outdoor, and culture brands. This is our first time designing a piano, and we’re stoked. 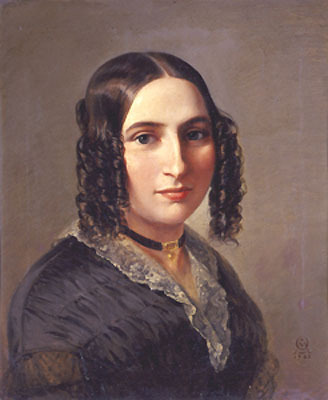 "Fanny Mendelssohn (14 November 1805 – 14 May 1847), later Fanny [Cäcilie] Mendelssohn Bartholdy and, after her marriage, Fanny Hensel, was a German pianist and composer. She composed over 460 pieces of music. Her compositions include a piano trio and several books of solo piano pieces and songs. A number of her songs were originally published under [her brother] Felix's name in his opus 8 and 9 collections. Her piano works are often in the manner of songs, and many carry the name Lied ohne Worte (Song without Words). She also wrote, amongst other works for the piano, a cycle of pieces depicting the months of the year, Das Jahr ("The Year")." Note: If you want to visit this piano, please contact the location. Many of our forever homes are not open to the public.